This Christmas morning the kids woke up and giggled all the way down the stairs to find all of their goodies Santa had stashed under the tree. We let them open their stockings while John and I woke up. That took about 2 seconds and they were ready for round 2 of present opening. 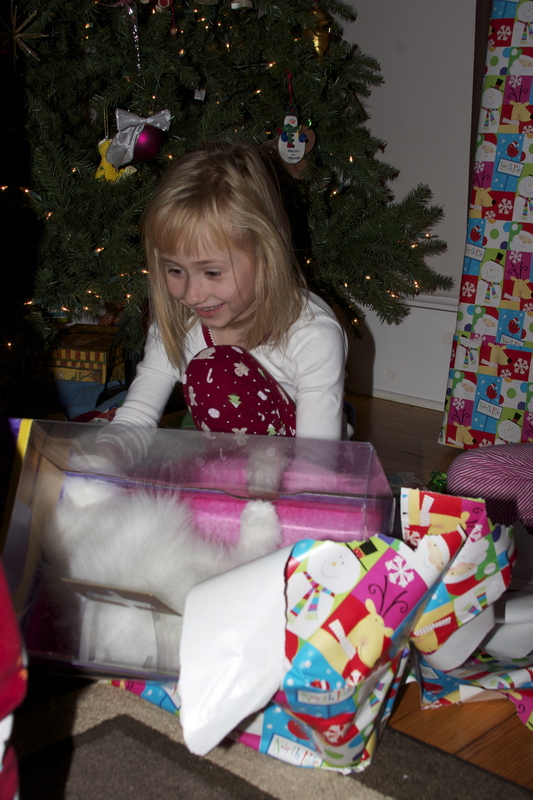 The one thing the kids all wanted were those godforsaken Pillow Pets. So of course Santa went all out! Kaelyn got her ladybug, Ian got his dolphin (definitely not a comfortable pillow) and Gavin got a dog. The kids also got other miscellaneous things like more wooden train tracks, puzzles, LuLu the Kitty that doesn’t ever stop meowing, and some board games. 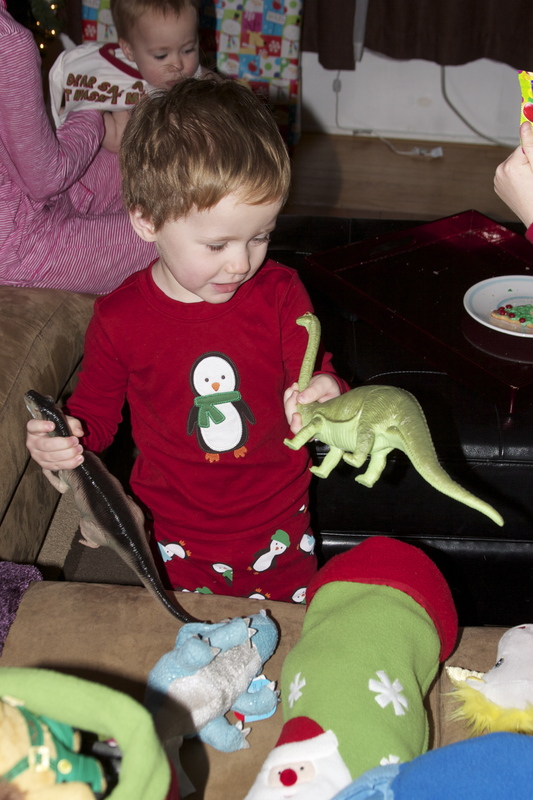 The boys got dinosaurs from Santa in their stockings. 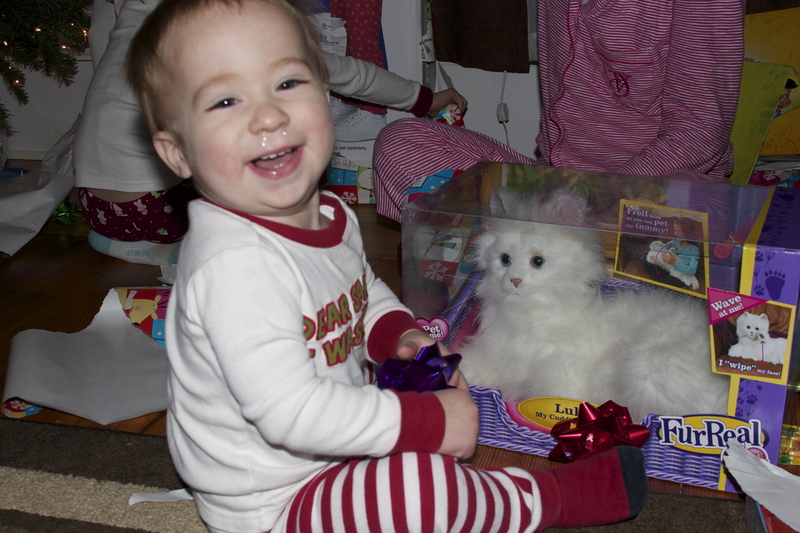 He was being such a cutie pie Christmas morning! Kae with her Dolly and Buttercup. The boys also got Mr. Pricklepants, Rex, Trixie, Lotso and Stretch, all from Toy Story 3 of course, in their stockings as well. Oh man, there she is. 13lb LuLu. That’s all I have to say. Gavin lovin on LuLu. Thinking that this cat doesn’t run away from me! Ian got some extension pieces to make his Thomas and Brio wooden railway systems bigger. 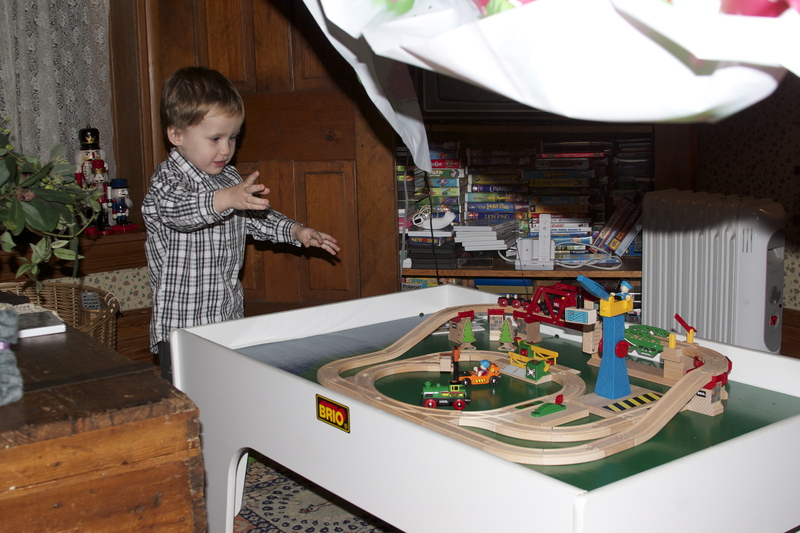 Little did he know a much bigger railway surprise was waiting for him at Nana and Papas! After the opening of gifts at home, we headed over to my parents house to opening up stockings, gifts and have John’s special biscuits and gravy breakfast before Baga had to work. The kids got more spoiled with all the attention from Maga, Baga and Uncle Steve and loved seeing what was hidden under all the wrapping paper. By this point, Gavin was kind of over the whole “gift” thing but Kae and Ian had no problems helping opening his gifts. 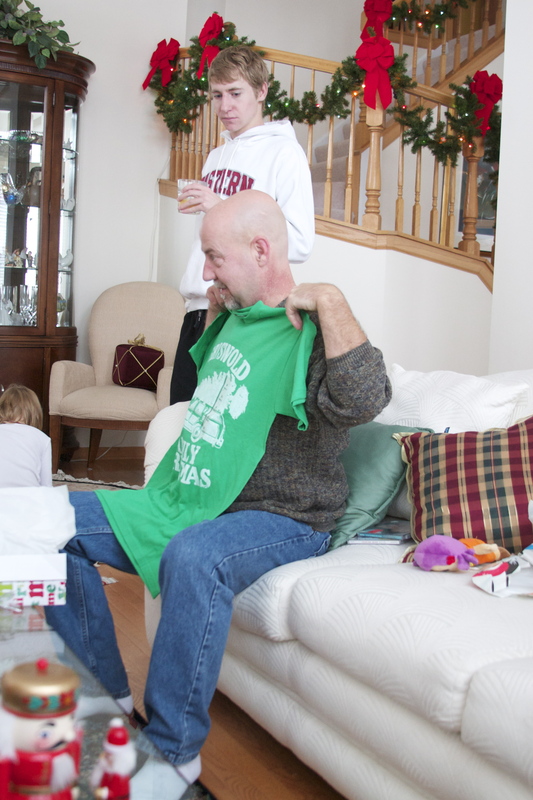 Ramone, from Cars, was in Ian’s stocking. He has been sleeping with him ever since. He also changes color, totally just like the REAL THING! Too cute. Kaelyn with her Selena Gomez and the Scene CD from Uncle Steve. She got this one signed by Uncle Dane today. Kaelyn also got the animals she wanted from the American Girl doll catalog, along with some more accessories and clothing for her dolls. 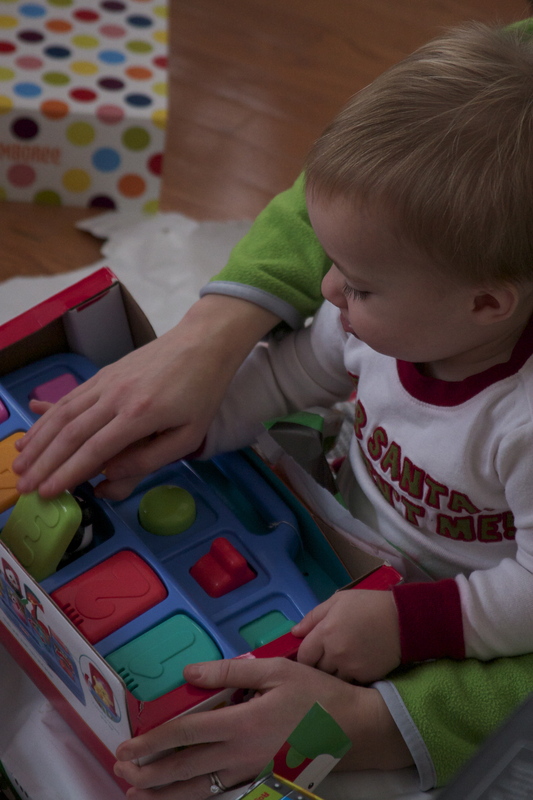 Gavin with his very own pop-up toy. After our Cathony celebration, we headed home and all took naps. We then headed over for round 4 of Christmas! The Rork Christmas! Nana, Papa, Megan, Pat and Al were all around to join in the festivities! Nana and Papa made an awesome roast, with tons of sides and drinks to go around! 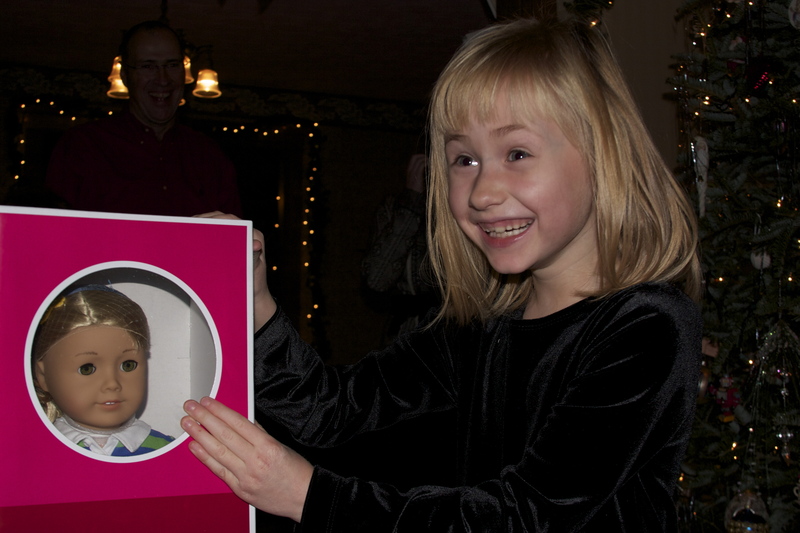 Kaelyn opened up her big gift from Nana and Papa and it was her very own American Girl doll, Lanie! Auntie Megan made Kaelyn and Lanie matching hats for the winter months! During the BIG reveal! 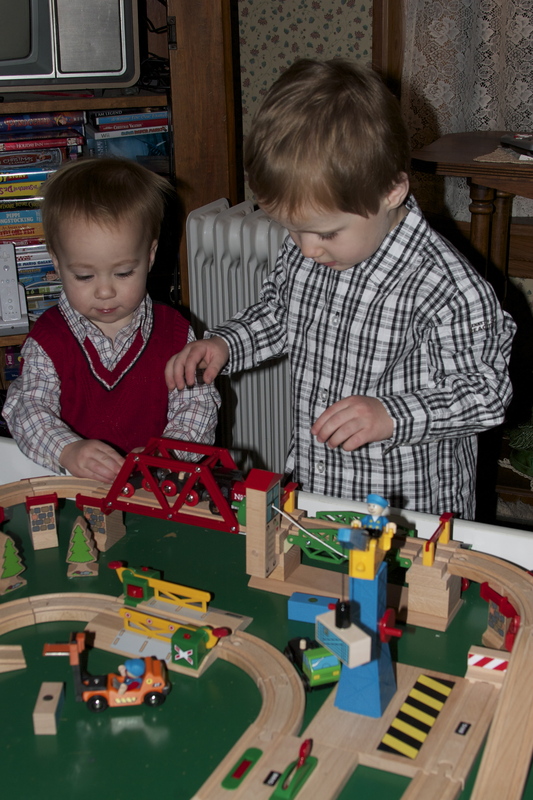 Ian and Gavin got their own Brio table and new track set from Nana and Papa! The one and only time we will capture on camera the boys behaving so nicely and sharing. Well Santa got a bit carried away. 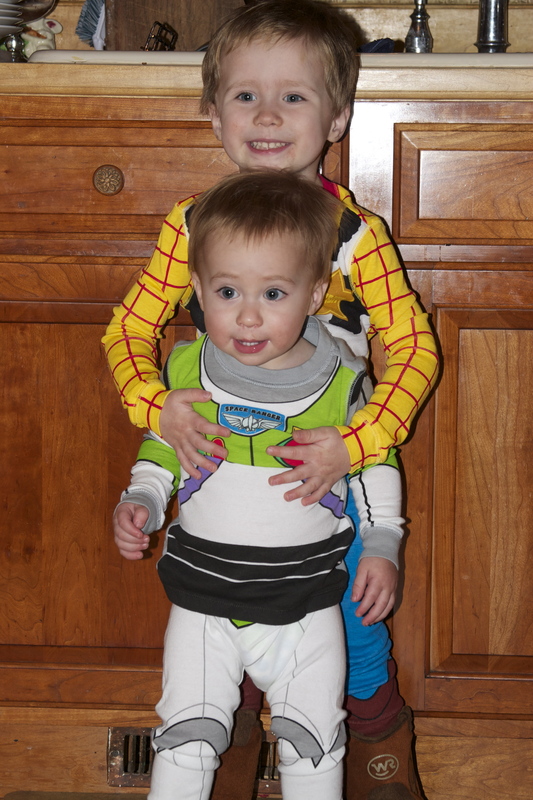 The boys love Toy Story and so does Mommy, so Santa decided to get them their awesome Buzz and Woody pjs for Christmas this year. 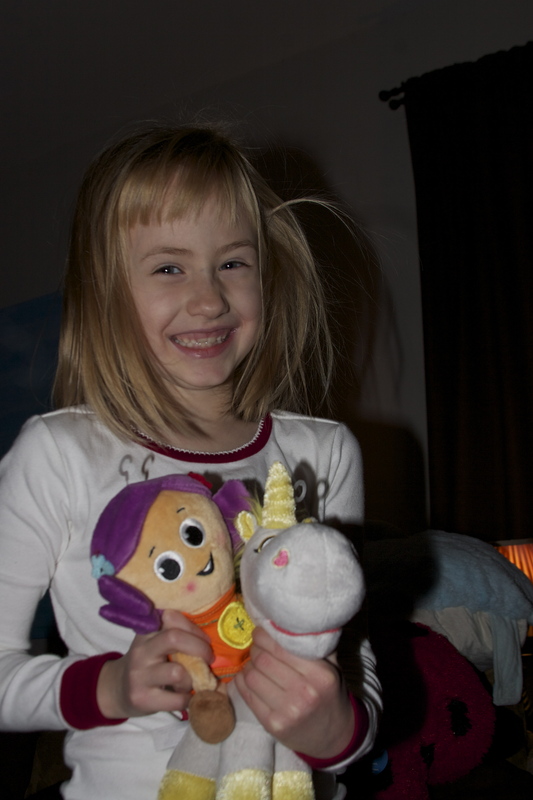 He was able to find some Tangled jammies for Ms. Kiki too. 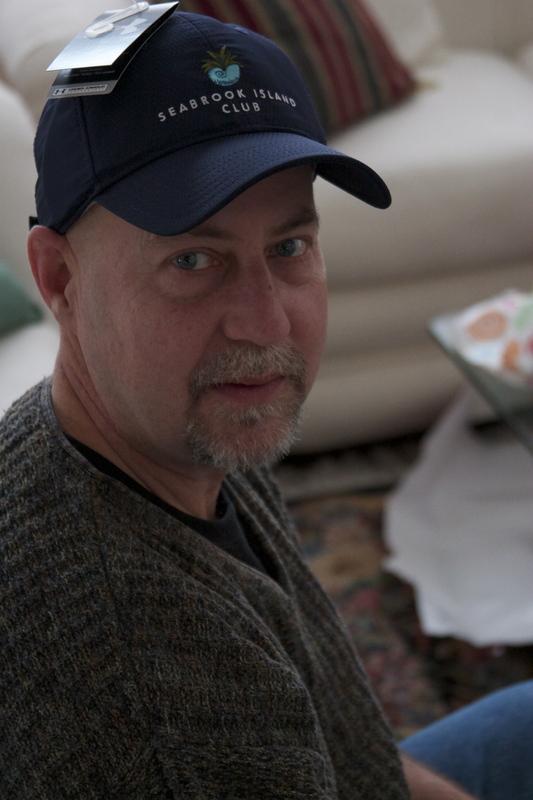 I’m almost finished wrapping up the end of the year posts. Just a few more to go and I’ll be all caught up! Next up blog: Downstate Springfield Trip to see Nana Nana and Papa Papa! We had a blast and are still full from all the eating we did down there 😉 Healthier foods and exercise are on our agenda in the new year! 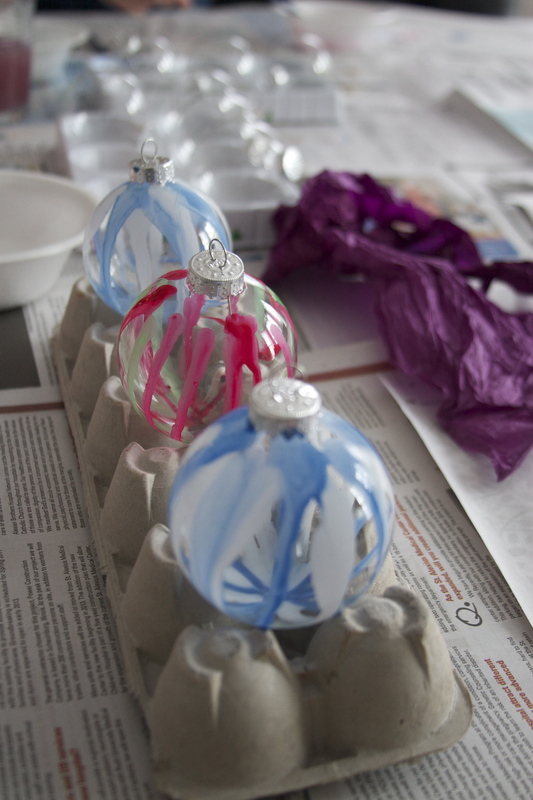 This Christmas Kaelyn and I made ornaments for our close friends and family. 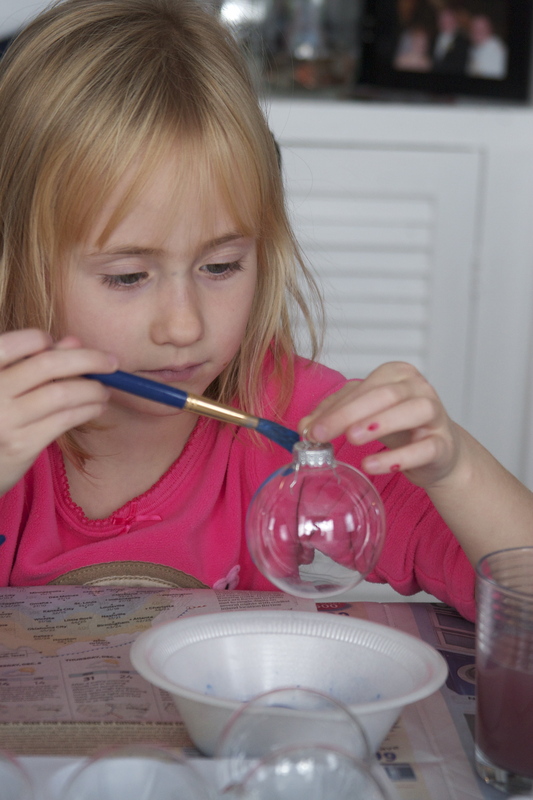 We made drip ball, paper-mache and got fancy with stick-on jewels and glitter glue! And boy did Kaelyn work hard! Concentrating. She loved mixing the colors and making them mesh together. Baga Baga would have been proud. Part of the finished product! So pretty! Now Gavin has been busy getting into things he shouldn’t. One way we divert his attention is to remind him of his book area. 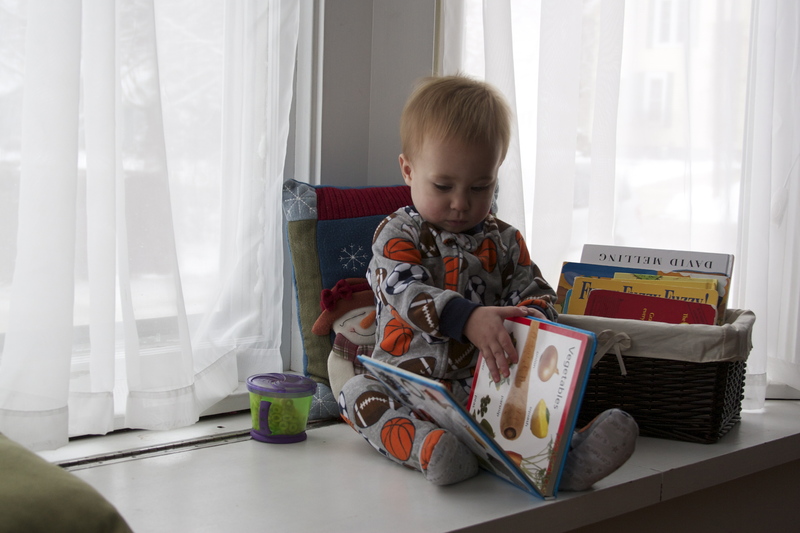 I set up 2 baskets filled with some of his favorite books and he will sometimes sit on the window sill for 30 minutes! 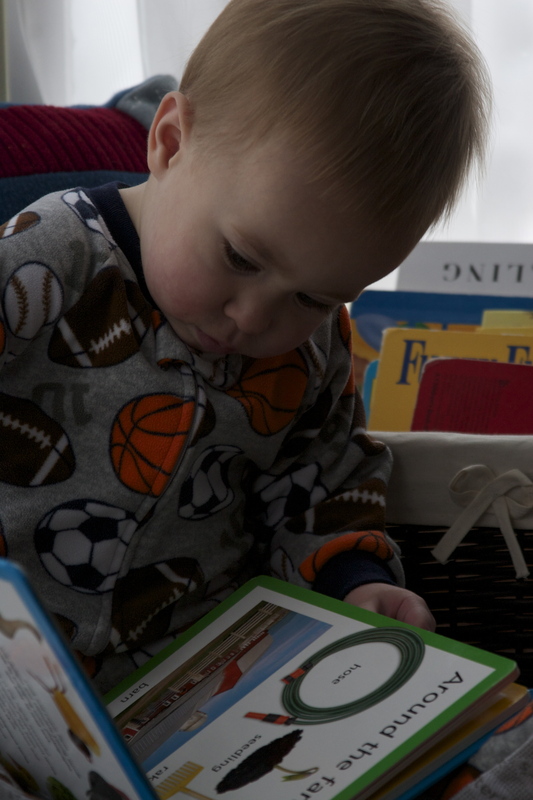 He is become such a big boy, can still be quiet at times but is studying what everyone else is doing. 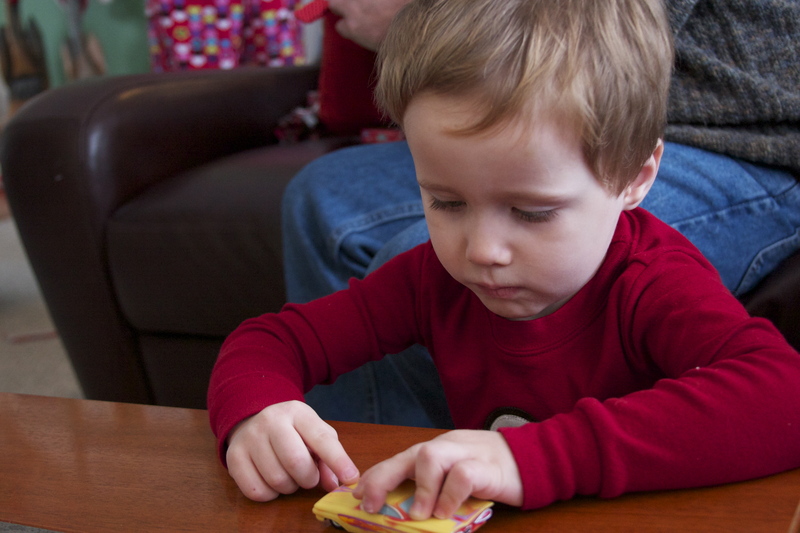 He loves saying his animals and what sounds they make, and sometimes will hum Twinkle Twinkle perfectly. 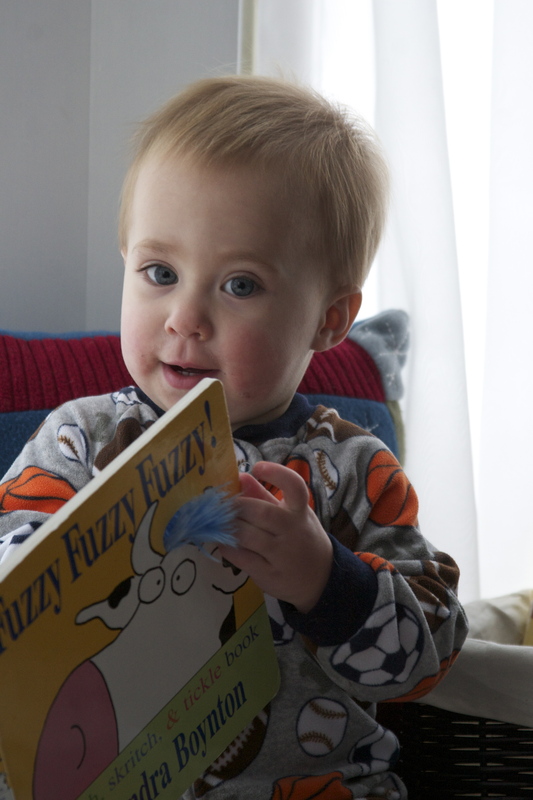 Reading his favorite, Fuzzy Fuzzy Fuzzy. I remember Doggies being Kaelyn’s favorite and Moo Ba La La La by Sandra Boynton being Ian’s favorite. I love the humor in her writing. Too cute. Once he is done reading his book, he either throws it down on the ground (typical) or puts it back in the basket (completely shocking). Lets just say I clean a lot of book up off the floor every day. Ian News: As of today, he has finally figured out the whole pooping on the potty deal. He’s also in the ‘potty game’ to win the gummy bears. Total manipulator. 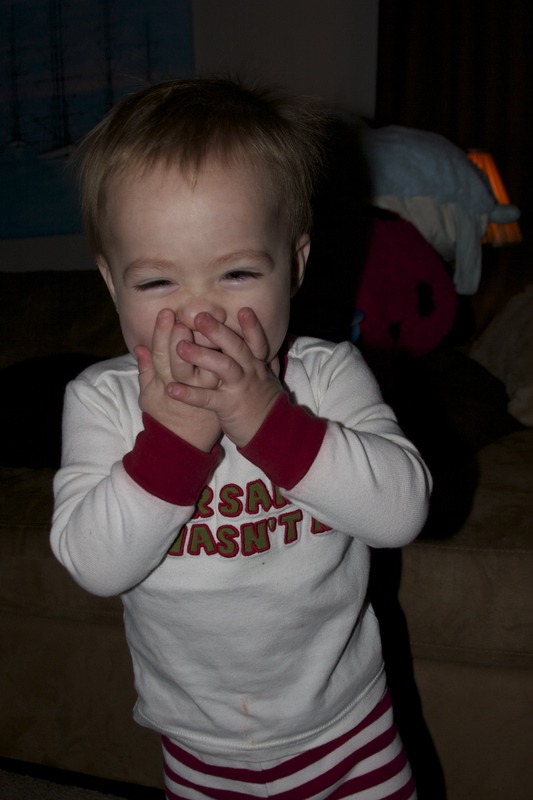 One squirt of pee and he thinks he can get a gummy…too funny. No pictures from this photo shoot. Next post should have EE too.